Andi Osho is the last black British person. 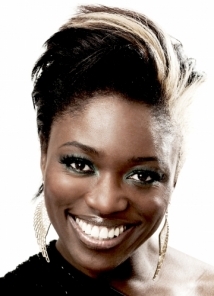 In three short years, British stand-up comedienne and actress Andi Osho has made a big splash on the UK comedy scene, with much talked about appearances on Mock the Week, Tonightly and Stand Up For the Week. Having reached the final of no less than five major new talent competitions in her first year, Osho is definitely regarded as one to watch. As well as an established performer on the stand up circuit, Andi is proving to be a popular guest on radio and TV for her cheeky, quick wit and effervescence. Only this year her appearances included several guest spots on Radio 1, Big Brother’s Big Mouth, Little Brother (E4) and The Culture Show (BBC2). Andi has also written on several projects including her own E4 pilot, The Andi O Show. Andi Osho is one of the most eagerly anticipated comedy newcomers in the UK. And has been a regular on Ch4′s Stand Up For The Week, as well as co-host on the anarchic Tonightly with Jason Manford. Her other television credits include: Mock The Week (BBC2), Psychoville (BBC2), Big Top (BBC1), Russell Brand and Friends (Channel 4),and her very own E4 pilot, The Andi O Show. Andi has just finished working on British feature film, Swinging with the Finkels featuring Martin Freeman. Andi has also written and performed on The Now Show (BBC Radio 4), Newsjack (BBC Radio 7) and Hot Gossip (BBC Radio 2). Andi worked as an actor for many years and has several screen credits including Eastenders, Casualty and Paradox. Kevin Nealon interrogates British Comedian Andi Osho at the Laugh Factory.